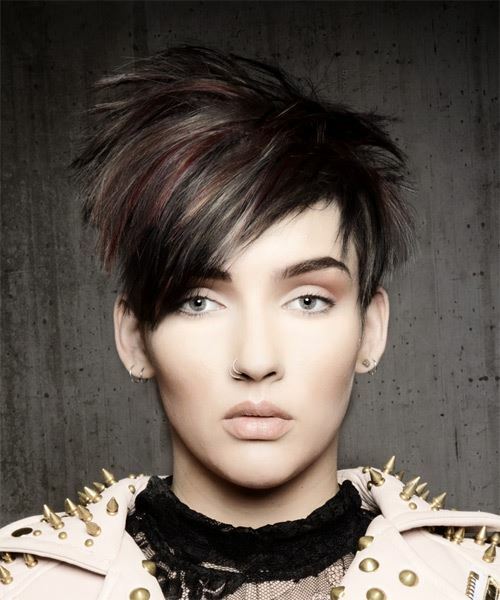 Our model is absolutely rocking this futuristic pixie punk 'do here with a multi-color effect. This hairstyle has been tapered into the head and the top of the head has many long, fine layers to frame her face. The sharp, straight cuts allows the styling of the hair to be a bit easier. The back and sides of this short and edgy style are tapered into the head, with the front and top having many long, fine layers to frame the face. The shape of this hairstyle is perfect to complement a triangular face shape and needs some extra strength wax for hold and shine. To finish off the look the back of the hairstyle has been combed at the roots to achieve height and volume. Darker hair colors will suit this hairstyle more as darker hair gives you more of an edgy look and feel. If you have a triangular face shape, this hairstyle is ideal for you as the layers will shape your face and create an oval effect. If will look nice if you add some deep purple color streaks to this look or even some platinum colors to stick with the color trends at the moments. You need to touch youâ€™re your roots to keep this hairstyle looking clean and trendy. Natural make-up application is the best for this look because you do not want to take away the star of the show which is this hairstyle. Glasses will look gorgeous with this hairstyle. Styling this hairstyle in the morning may take a bit longer than usual. You will need some hairspray and mousse to keep it all in place but we promise you, it is all worth it!